testing or optimization of an application or driver. Also, this product fully supports advanced filtering search, data exporting options and professional built-in terminal, an easy-to- use interface, and more. It's a software solution that is complete on its own and requires no additional hardware before it can be used. Serial Port Monitor is available for purchase as a Standard, Professional or Company Edition. Serial Port Monitor gives you the freedom to perform serial port activity analysis. You can connect a Serial Monitor to a COM port that is already open by another application so you can begin sniffing right away. All data that passes through the monitored port will be available in several views in our monitoring tool. The transcript hint from Line view is featured in table view packets. Everything gets captured instantly so that you can identify problems quickly enough. The synchronized highlighting of similar IRPs in varied views is especially ideal for comparison. Moreover, you have the option of copying all recorded data to clipboard or redirecting all monitoring data to the file specified. COM Port Monitor allows you to intercept and record serial IOCTLs (serial input/output control codes), monitoring all parameters thoroughly. Any monitoring session can be saved and loaded again whenever you need to use it. This software comes with a special functionality that allows it to monitor multiple COM-ports simultaneously. Now it's possible to gather data on the interaction of apps with two or more ports and some devices that are running concurrently within a single session. Send and receive data during monitoring will be represented in a single log using a first-in-first-out approach; that way it's more convenient to analyze. Data can easily be viewed simultaneously in all four monitoring views: dump, time, line or terminal mode. 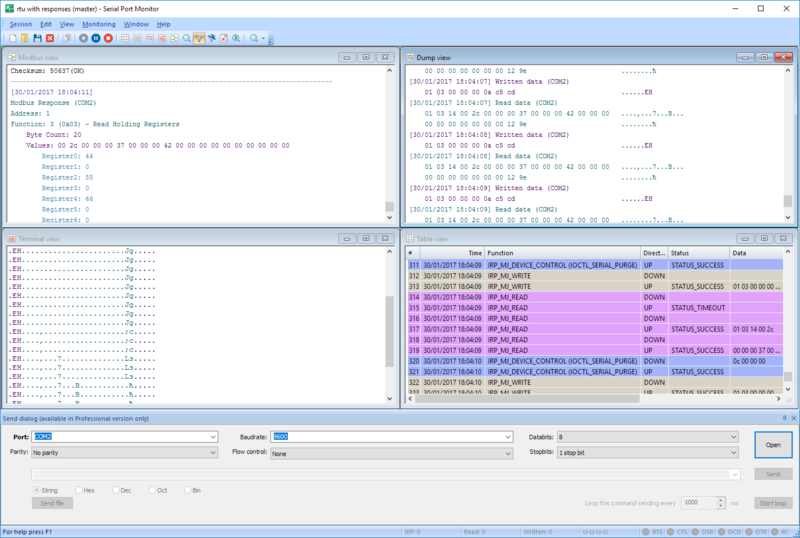 Dump view is capable of displaying port settings, binary, as well as ASCII data. With COM Monitor, you can select monitoring filters, thereby saving time and allowing you to keep abreast with only the events in which you are interested. It's also possible to use Capture option during the ongoing monitoring process. Data can be sent in various formats (hexadecimal, string, decimal, binary, mixed, octal) to monitored serial port as if terminal mode feature of Serial Monitor was used to send it on behalf of the monitored application. Thus you can follow how the monitored serial device reacts to some special commands. COM Port Monitor is equipped with new efficient filters which will facilitate the reading and analysis of Modbus data. Our serial monitoring software can help you establish connection with RS485/RS422/RS232 devices easily, as well as thoroughly analyze their data. Serial Port Monitor makes it possible for you to get a unique session playback – data received from the app can be sent again to the serial port. This way you can easily review port's reactions as it receives the same data for better results. Also, it's possible to compare sessions with automatic display of differences that exist between them. It's possible to monitor any hardware or software that works with a serial port.